The National Council of County Association Executives met Oct. 15-19 in Lawrence County (Deadwood), S.D. for the association’s annual meeting and elected 2018-2019 officers. 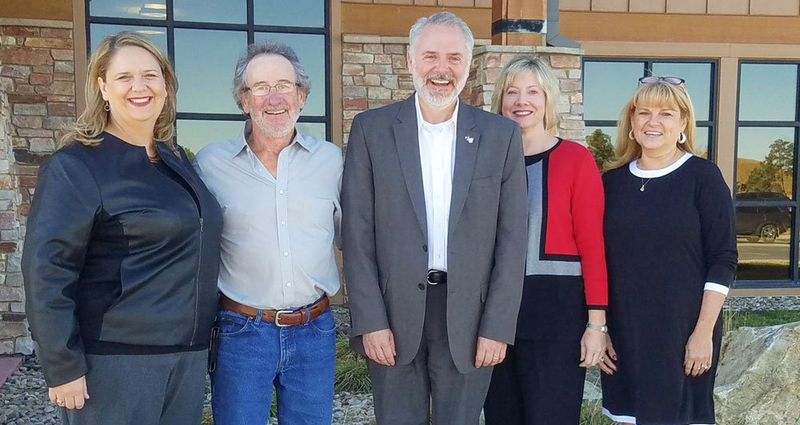 From left: Third Vice President Julie Ring, executive director, Association of Minnesota Counties; Second Vice President Bob Wilcox, executive director, South Dakota Association of County Officials; President Chris Villines, executive director, Association of Arkansas Counties; First Vice President Suzanne Dulaney, executive director, County Commissioners Association of Ohio and Immediate Past President Vivian Parsons, executive director, County Commissioners Association of West Virginia. Diane Duff has joined NACo as director of corporate relations. She served as executive director for the National Association of Workforce Development Professionals and the Southern Governors’ Association and earned a bachelor’s degree in communications from the University of Maryland. Kathy Rowings, associate program director, presented on effective criminal justice reform strategies Oct. 15 at Rockingham County, Va.’s community forum. Executive Director Matt Chase, Counties Futures Lab Director Hadi Sedigh, Associate Legislative Director Jack Peterson and Executive Assistant Jamie Richards gave NACo updates Oct. 15 at the NCCAE Annual Meeting in Lawrence County (Deadwood), S.D. Lindsey Holman, associate legislative director and Shanna Williamson, NOAA digital coast fellow, presented at the Gulf States Counties and Parishes Caucus Meeting, held Oct. 17-19 in Baldwin County, Ala. If you’re getting County News, you’re seeing the best of what NACo and county government have to offer. That’s the way Bev Schlotterbeck wanted it for more than 30 years.